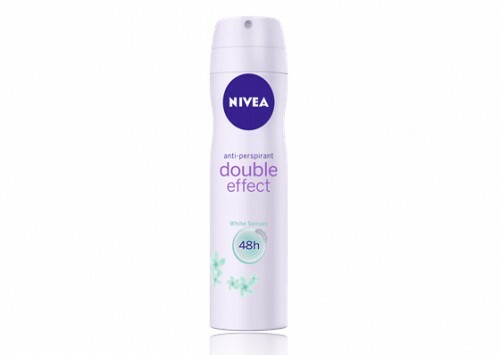 NIVEA Double Effect Anti-Perspirant Aerosol has been scientifically formulated using natural Avocado-extract to soften the skin and hair of the underarm, allowing for a closer shave and leaving your underarms feeling smoother for longer. Contains Avocado Extracts to help giving you smooth underams for longer. Double Effect = Double Itchy! I'm not sure what ingredient is in this but I reacted to it severely. This made my armpits extremely itchy and red. I tried on 2 separate occasions so know that this product was definitely the culprit. Nivea's a brand that can be accesed at most department stores. I like to buy these deodorants for added protection. In summer I need to use these because I sweat easily. This spray can comes in a soft subtle mauve can. Smooth to touch. Has the Nivea labelling on it. This can is easy to spray. Its a liquid spray . Its not like a dry spray. This scent smells creamy dreamy and fresh. When I use this spray it lasts me up to three hours and it begins to fade out for me. Surprisingly I didn't have any irritations under my arms. I shave regularly and I usually get a nasty sting when using sprays. Thankfully for me I didn't with this one. I got mine from the warehouse. They had a 25% off sale. I managed to get my can of spray at an affordable price. I think it's fairly priced. One bottle lasted me three months with regular use. I would definately buy it again . There's so many more Nivea products I would like to try out. This lovely antiperspirant comes in a cute mauve spray bottle with the distinctive Nivea logo and a nice design on it. The design of the bottle makes it comfortable and easy to hold and use. The product is easy to apply with a ridged spray top. The product sprays as a liquid powder with a lovely gentle, but feminine, perfume. It doesn’t sting on application, dries quickly, and doesn’t leave any marks or stains on my clothing. The product claims to soften the skin and hair of the underarm, allowing for a closer shave and leaving your underarms feeling smoother for longer. My underarms do feel softer since I’ve been using it. It is my at-work spray. It lasts all day, and possibly does last 48 hours, but I can’t go that long without showering to test it out! I bought it for $6 at Countdown, and will buy it again. I would recommend it to others as I like it myself. It comes in a spray bottle. It is so quick and easy to use and it dries fast. I really like this spray deodorant, It has a very light and fresh scent. It is gentle on my skin, does not cause any rashes or irritation/ ingrown hairs even though I shave my underarms. It does an amazing job keeping my underarms dry throughout the day and eliminating sweat and odour. This Nivea deodorant left my underarms smooth and feeling amazing. This spray deodorant does not leave any residue or stains on my clothes. It does not last 48h as it claims, on hot days or when I work out, I have to reapply a few times a day. Overall, it is a good essential deodorant for everyday use. Great value and does the job. I find this to be okay for everyday use in winter, but I need more sweat protection in summer and in stressful times. It isn't a suffocating scent or spray like some I have used but It certainly isn't my favourite either. It has less residue transfer than a few brands I have tried but will leave white marks on black clothing. My underarms are not irritated by this even if I have recently shaved or have razor-burn. I don't think it lives up to the 48hrs claim but it does do 8+ hours in non-stressed state for me. The spray disperses nicely, doesn't wonder around the room much compared to others, and it isn't to chilly to apply on cold mornings. It feels like a powdery finish when dry. Nivea is one of my go-to brands for supermarket products. I used to buy roll on's, but have lately switched to spray anti-perspirants, after trying some and being impressed. I like how they are just so convenient and great to pop in your bag. This anti-perspirant's packaging is stylish and sleek. The blue and white Nivea emblem is iconic of Nivea. It's in a long spray can that's sturdy and convenient. Firstly, I do quite a lot of exercise everyday chasing after my toddler and walking a double buggy that can be quite a work out! So, a antiperspirant that protects me all day long is important. This antiperspirant smells lovely and a spray of this keeps me feeling fresh for a long time. I'm not a person that sweats significantly, but this really does do the job of keeping me fresh and feeling nice all day. My underarm skin can be sensitive and irritated by some antiperspirants, but this was gentle and nice on my skin. With continued use I did find that hair I removed under my arms was softer, so I do think it is effective in what it claims. Overall another great antiperspirant from Nivea and I won't hesitate to repurchase. The scent is just gorgeous! I decided to try this and aerosol anti-perspirant because I was sick of the roll on that I had to keep applying. So I decided to try something new. Now I have lots of sprays from impulse to Calvin Klein that have lasted me a long time. Not this one, I have never gone through a spray so quickly and I was only using this one under my arms the other one would cover my whole body everyday. It also didn't actually work as well as the roll on. So if someone gave me one I'd happily use it, but I wouldn't buy one for myself. However on the plus side. The spray bottle was a really good quality, no lids that fell off or sprays that stuck. So they did well with that. I'd just like more product. They also did fine on the smell, though I like some of their others better. But it definitely did not last 48 hours. I really enjoy this anti perspirant, and its one of my favourites. It doesn't last 48h like it says, however it does do a good job for the day (12 hours). It has a nice scent and doesn't hurt my underarms like other sprays in the past. Tips: Do not spray to close to the skin or straight after shaving. Absolutely adore the smell of this product which is why I used to purchase religiously. However make sure you face away from where you spray as it tends to go everywhere. I love the size and design of can, just perfect for the gym bag. I have to say I have seen no visible smoothness compared to other brands. Sadly this product just is not effective for me since they changed the recipe. Come lunch time I smell and have to reapply. Luckily the roll on still works. Tips: Listen to the instructions and don't spray too close to the skin or it stings!